Authored by davidre on Feb 7 2019, 12:28 PM. This shows all the pictures inside the folders added to the Folders list. I also tried to make single pictures excludable via a checkbox on the thumbnail. This is the first time for me programming with QT/QML/Singals-Slots and I tried to use as much existing code as possible. The thumbnail view is the same as for single images and I simply subclassed the listmodel. However even if I tried to do everything like the code for slidePaths it doesn't work correctly. The checking/unchecking of images only applies on restart of plasmashell. Maybe it's a single mistake that is easily spotted by a more experienced programmer otherwise if the thumbnail view is accepted I can also revert all the checkbox stuff. I don't know why the images aren't removed immediately on your side. I just did a clean build and removed everything from my installation prefix and it still works for me. Are you testing directly on the master branch? Maybe the difference is that I'm building on the 5.14 branch because of dependencies? Could be. Since this is going to land on the master branch (because it's a new feature, not a bugfix), ideally should be developing on the master branch too. Yes I also saw this method since the backgroundlist uses it but the Header said to use KRun if you want to open a folder instead of it. Well it just depends on what you want to do. If you want to open the folder, then yeah KRun is better. But if you want to highlight it in a file manager window, then highlightInFileManager() is the way to go. I just realized: setting this to false when in slideshow mode is a quick way to make them non-selectable. Maybe @davidedmundson can shed some light on this puzzle? I just build the patch in a VM and it works as intended. Sorry I would have hoped that it didn't work so that I could investigate your issue. Currently you have a very long folder list object. However, in my experience most users only have a few folders, where they store their wallpapers. So, what about saving space by positioning the folder list to the right of the controls? As we now display only folder names and not whole paths, the width should be fine and if you have more than 5 different folders, scrolling should be a good option. Further, if you are about to delete a folder, the images belonging to the selected folder, could be highlighted somehow. That way you know what you are about to remove without explicitely doing arduous investigation. Do you mean the Controls on the top? I don't know if it's possible because as far as I have determined from reading the Code the topmost element that is painted by the imagewallpaper-plugin is the "Positioning"-row meaning less vertical space. Also if you look at the screenshot ngraham posted you can see that it is used in other where the elements are aligned differently and I don't know the behaviour then. I guess if the list is right to Positioning and "Change every..." this would cause the Positioning row to jump around when the mode is switched from single image to slideshow. Please correct me if I'm wrong. I guess this could be done like when you remove single images but we would need to think about a way to mark the removed folder in the list. Maybe in another patch? Exactly, but let's wait for the expertise of Nate and the rest of the VDG team as I am not sure myself. I have a hard time figuring out how to hide the tooltip if a tooltip of an action is shown. Is there any way to detect this or get to the actions' tooltips to check if they are visible? Nevermind. Reading the Documentation again sometimes helps! Change copypasted "Open Containing Folder" to "Open Folder"
KIO::highlightInFileManager() does in fact open the containing folder, so the old tooltip was correct! :) If you want to use "Open Folder" as the text, you should go back to using KRun to open the folder itself. I just tested it and it seems we're both right . It seems if a path nds with a slash (i.e. if you typed the path in in the selection dialog) it opens the folder itself while opening the containing folder otherwise. To make this consistent I would like to go back to using KRun to get the same behaviour in both cases. Why do we need two instances? Can you elaborate on that please? Are you saying I should assign my Model to m_model and then cast it to call the added method? Or something different like overriding an existing method or adding the functions BackgroundListModel? @ngraham, are the corresponding images now removed after removing a folder with the removal of the token check? I can't think of a reason why it doesn't work for you :/. Maybe we can debug this on your side. Or the problem is on my side and it only works for me. Maybe someone other can comment if it works for them or not? It's a bit wasteful as we ultimately end up scanning all the wallpaper directories once in the main view then again when we have the config view open. But we should follow that up another day. It's non-trivial. One minor change, which isn't really your fault, it just shows up now. When you're on the Image (not slideshow!) tab, and then close the window or select "Plain color" it will instantiate an instance of SlideModel during closure. It seems to be because configDialog.currentWallpaper changing gets evaluated here before the main view reloads. it shouldn't be emitted when changing between image and colour. I have a sequence that breaks. Hmm, with this version, the right panel never gets populated at all, and the Open Folder button no longer works. Also the buttons are too far apart and too far from the right edge of the SwipeListItem, but that may be a Kirigami issue for @mart. I've found out the difference in why it works for me and not for @ngraham. He installs to /usr and I tested from a folder in my home directory. Has anyone any hints how to fix this? If I install to /usr I get config.qml:317: TypeError: Cannot call method 'indexOf' of undefined. 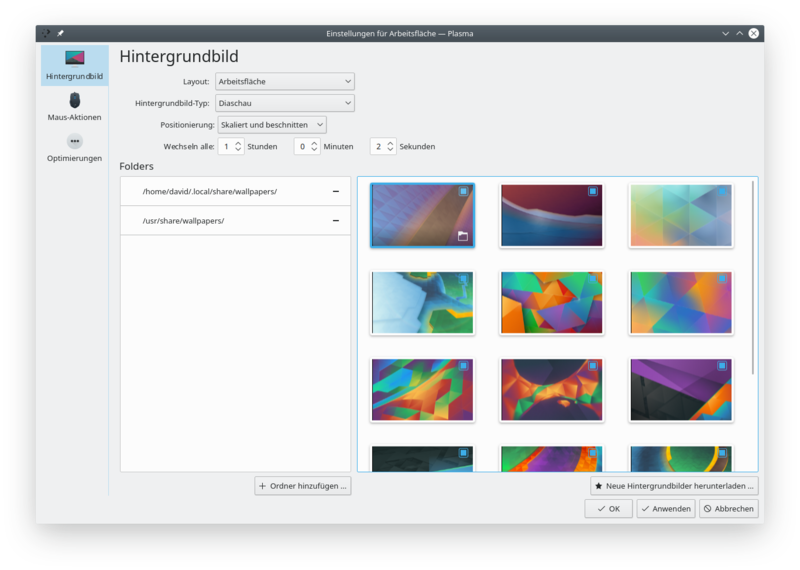 I checked again with Console.log inside Gridview and imageWallpaper.slideshowModel is undefined and currentWallpaper is org.kde.slideshow. However if I install it to somewhere in my home folder imageModel.slideshowModel is not undefined (qml: SlideModel(0x558e383d0e00)). I have to investigate more as I don't understand it. and see if you get two results. I copied the newer one (the one with the patch applied) over the older one and it works again. I guess plasmashell loaded the old library? Cleaned the build dir and rebuilt everything from scratch, and now it works again, at least as good as it did before. I still don't see images removed from the right pane when their folder is removed, but seeing as how it works for everyone else, I won't block this anymore. The UI looks good anyway! Hi I see a different behavior. If I add a subfolder of a added folder nothing changes. If I remove it the images in it are removed, however they should be retained as they're included by the parent folder. Here The other way around all pictures are removed even though the ones on the subfolder should be retained. I can see it listing all sizes, if I just add the package. I think this is a bug in BackgroundFinder::run. It doesn't find ./metadata.desktop. If you add just the package folder and enable the commented out qCDebug statements or inspect m_SlideshowBackgrounds after starting a slideshow you can see that all sizes are added to the slideshow, too. added only images. As a replacement I added the addDir method. Finally, this latest version works for me! Plasma folks? First and foremost I thank you as a user for giving this bit of code much needed love. FWIW the Image Frame widget allows toggling between random and alphabetical ordering for its slideshow, so that might be useful as a template. For that matter, it might make sense to use this view in the Image Frame widget directly--after porting that feature over of course. Less code duplication for two views that are doing the same thing.